Disclaimer: Please note all information provided on this ValRoseWoodWorking web site is provided as helpful information. Insturctions and other information are not guaranteed to be complete or all incompensing. The final construction and use of items aquired from this site are subject to the personal interpretation of the reader, and their resultant use whether succesful or damaging in material or personal injury is the sole responsibilty of the reader. This is an idea outside of the box. A shooting board with depth stop. Useful for controlling depth of cut and edge to edge parallism. Good for a novice hand planer like me. 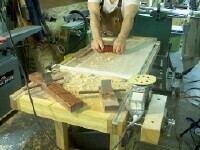 Flattening a table top and edge finishing with scraper and hand planes.